Does not cross-react with TBLR1. Our Abpromise guarantee covers the use of ab24548 in the following tested applications. WB 1/1000. Detects a band of approximately 64 kDa (predicted molecular weight: 63 kDa). F-box-like protein involved in the recruitment of the ubiquitin/19S proteasome complex to nuclear receptor-regulated transcription units. Plays an essential role in transcription activation mediated by nuclear receptors. Probably acts as integral component of corepressor complexes that mediates the recruitment of the 19S proteasome complex, leading to the subsequent proteasomal degradation of transcription repressor complexes, thereby allowing cofactor exchange. Belongs to the WD repeat EBI family. The F-box-like domain is related to the F-box domain, and apparently displays the same function as component of ubiquitin E3 ligase complexes. 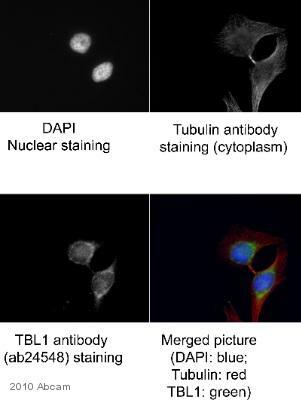 Anti-TBL1 antibody (ab24548) at 1/1000 dilution + HeLa nuclear extract. 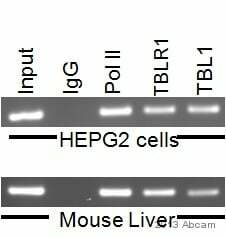 TBL1 was immunoprecipitated using 0.5mg Hela whole cell extract, 5µg of Rabbit polyclonal to TBL1 - ChIP Grade (ab24548) and 50µl of protein G magnetic beads (+). No antibody was added to the control (-). 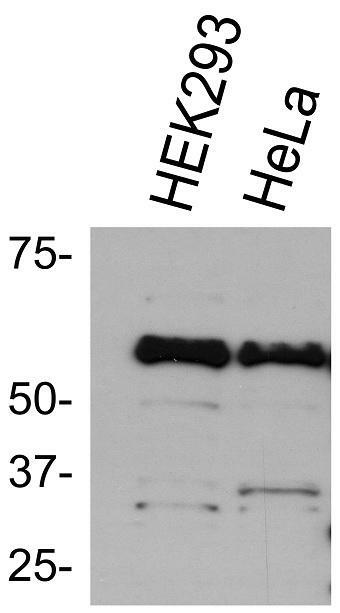 Proteins were eluted by addition of 40µl SDS loading buffer and incubated for 10min at 70oC; 10µl of each sample was separated on a SDS PAGE gel, transferred to a nitrocellulose membrane, blocked with 5% BSA and probed with ab24548. ab24548 staining TBL1 (green) in Human Hela cells by ICC/IF (Immunocytochemistry/immunofluorescence). Cells were fixed with methanol and blocked with 0.2% fish scale gelatin for 1 hour at 25°C. Samples were incubated with primary antibody (1/300 in PBS + 0.2% fish scale gelatin) for 20 minutes at 25°C. An Alexa Fluor®488-conjugated Donkey anti-rabbit IgG polyclonal (1/500) was used as the secondary antibody. Publishing research using ab24548? Please let us know so that we can cite the reference in this datasheet. Multiple bands in WB with human cell lysate. Thank you very much for your call today and for letting us know about the trouble with this antibody. Please keep me updated about the results after trying the alterations that we discussed. If the results are still not satisfactory, I'll be happy to help you further. If there is anything else that we can do for you, please don't hesitate to ask. I look forward to hearing from you, and have a nice day.